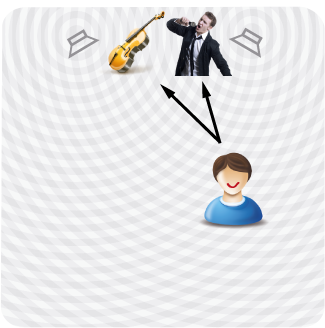 SweetSpotter adaptively adjusts the sweet spot of your stereo system to your current listening position in real-time. Your actual position is tracked using your webcam. The spatial reproduction of sound in a conventional stereo system works in a small area which is located on the symmetry axis between the loudspeakers – the so called sweet spot. Beyond this area, the spatial perception collapses and the stereo image moves to the nearer loudspeaker since the signal arrives both louder and sooner. Finally, the stereo image is completely located in the nearer loudspeaker due to the precedence effect. Although stereophony has a long history, the listener has not yet been released from its static hearing position. 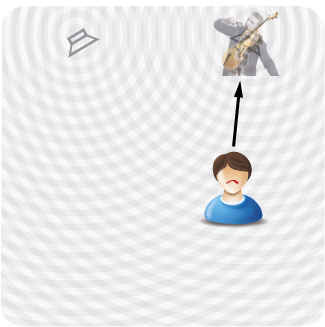 SweetSpotter demonstrates a playback system which adjusts both loudspeaker signals depending on the listener’s position in real-time. 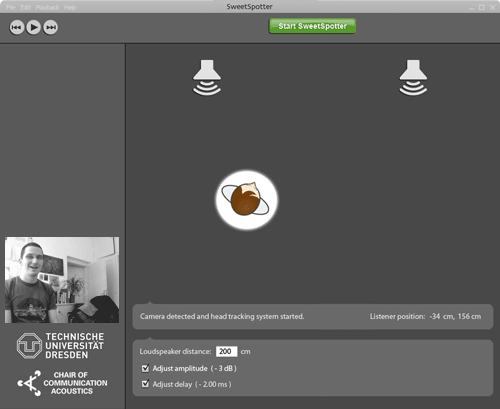 The position and orientation of the listener is tracked by a webcam and a face recognition system (head tracking). This information is used to calculate the amount of delay and amplification in the corresponding audio channels. Thereby, a correct phantom source localization over the whole off-center listening area is achieved. The sound localization with adaptive adjustment of the sweet spot is investigated at the Chair of Communication Acoustics, TU Dresden, Germany. 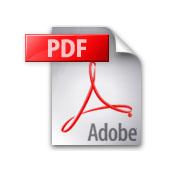 This site describes the research work and software development done by Sebastian Merchel, Stephan Groth and Lars Beier. Sebastian Merchel and Stephan Groth: Analysis and Implementation of a Stereophonic Play Back System for Adjusting the “Sweet Spot” to the Listener’s Position, Proceedings of 126th AES Convention, Munich, Germany, 2009. Sebastian Merchel and Stephan Groth: Analysis and Implementation of a Stereophonic Play Back System for Adjusting the “Sweet Spot” to the Listener’s Position, Journal of the Audio Engineering Society, 58(10) 2010, 809–817. Sebastian Merchel and Stephan Groth: Evaluation of a New Stereophonic Reproduction Method with Moving “Sweet Spot” Using a Binaural Localization Model, Proceedings of ISAAR Symposium, Helsingør, Denmark, 2009. This software is Open Source under the GNU General Public License version 3.0. Experimental SweetSpotter port to PureData by Xiangqiong Zeng and Xin Yang. You will need an external head tracker, e.g. FaceOSC to get tracking information.